Sridhar, Shrihari, Sriram Narayanan and Raji Srinivasan (2013) "Dynamically Coordinating Inventory, R&D, and Advertising Spending" Journal of the Academy of Marketing Science, Forthcoming. Narayanan, Sriram and Ram Narasimhan (2013) "Contract choice, supplier characteristics and sourcing relationship performance" Decision Sciences Journal, Forthcoming. Narasimhan, Ram, Sriram Narayanan, and Ravi Srinivasan (2013) "An Investigation of Justice in Supply Chain Relationships and their Performance Impact," Journal of Operations Management, 31(5) 236-247. Narasimhan, Ram and Sriram Narayanan (2013) "Perspectives on Supply Chain Driven Innovation" Journal of Supply Chain Management, Forthcoming. Lahiri, Nandini and Sriram Narayanan (2013) "Vertical Integration, Innovation and Alliance Portfolio: Implications for Firm Performance" Strategic Management Journal, 34(9) 1042-1064. Jayaraman, Vaidy, Sriram Narayanan, Yadong Luo and Jayashankar Swaminathan (2013) "Offshoring Business Process Services and Governance Control Mechanisms in Emerging Markets: An Examination of Service Providers from India" Production and Operations Management Journal, 22(2) 314"“334. Narayanan, Sriram, Vaidy Jayaraman, Yadong Luo and Jayashankar Swaminathan (2011) "The Antecedents of Process Integration in Business Process Outsourcing and its Effect on Firm Performance" Journal of Operations Management, 29(1-2) 3-16. (Lead Article). Narayanan, Sriram, Sridhar Balasubramanian and Jayashankar Swaminathan (2011) "Managing Outsourced Software Projects: Antecedents of Project Performance and Customer Satisfaction" Production and Operations Management Journal, 20(4) 508"“521. Narasimhan, Ram, Sriram Narayanan (2009) "In Search of Outsourcing Excellence" Supply Chain Management Review, March, 36-42. Narayanan, Sriram, Sridhar Balasubramanian and Jayashankar Swaminathan (2009) "A Matter of Balance: Specialization, Task Variety, and Individual Learning in a Software Maintenance Environment" Management Science, 55(2) 1861-1876. Narayanan, Sriram, Ann Marucheck and Robert Handfield (2009) "Electronic Data Interchange: Meta - Analysis, Research Review and Future Directions" Decision Sciences, 40(1) 121-163. Sriram Narayanan and Ram Narasimhan had a paper accepted for publication in IEEE Transactions on Engineering Management. "Getting Value From the Cloud" was recently accepted for publication by the Supply Chain Management Review. 61 students from the SP Jain Institute of Management and Research will head to the Broad College for supply chain. Production and Operations Management is now on the Business Week list of 20 premier journals. "Production Planning Using Evolving Demand Forecasts in the Automotive Industry" accepted for publication. 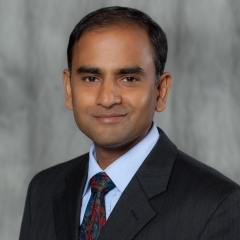 Narayanan appointed senior editor of Production and Operations Management Journal.